Even though we had a smaller group (17 players) for the August Scholastics, it was still enough to field all three Sections - 14 & Under, 8 & Under, and Non-Member. Great congratulations to Tye Moore who not only took home the 1st Place Trophy in the 14 & Under Section but did so bouncing back from a tough go in the Charles Drafts the day before. Tye showed an inspiring example of perseverance and skill this weekend, and I look forward to seeing him in future tournaments. We were glad to have four non-Member players and hope that all will join USCF soon and compete in the regular Sections. No better feeling in chess at the beginning of your chess career than that first rated tournament. 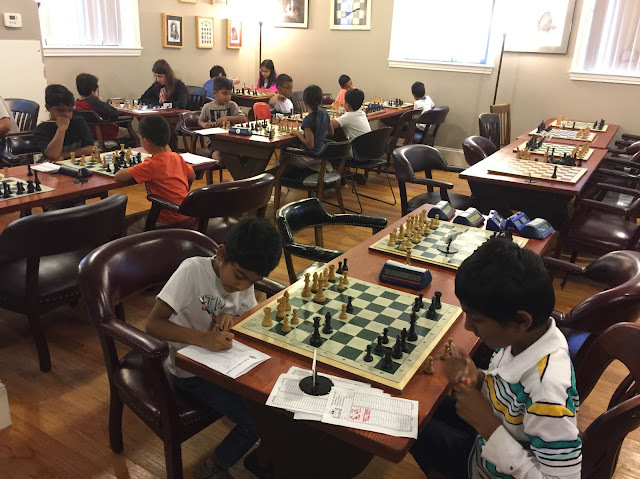 Our next Scholastic is on 9/23/18, and the Spiegel Cup Series Tournament for the 2018-2019 Spiegel Cup season is on 10/21/18. We'll see you over the board.